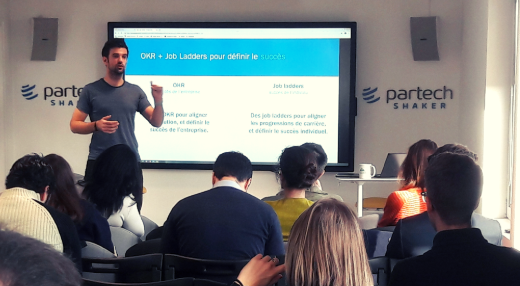 Partech Shaker once again hosted Arnaud Meunier, Partech's entrepreneur-in-residence and serial entrepreneur, for a talk on the use of job ladders in motivating and retaining employees. => What is a job ladder? => Why create and use job ladders? 1- To ensure employees know what is expected of them. It is not because you are a talented and excellent manager that you should become a manager. Talented engineers do not necessarily make good managers, and this is why an “efficient” job ladder is a must. 2- Getting promoted doesn’t mean that you are stealing someone else’s seat. If you are waiting for the person above you to leave in order to get promoted, something is wrong. 3- Career progression should be transparent: employees should clearly understand how they can progress in their careers, what is expected of them and how it’s rewarded. 4- A transparent salary process: why is one employee paid less than his/her colleague? Everything should be clearly stated in order to avoid any feelings of injustice. Ideally, you should have a job ladder per job function: for engineering, products, and management, etc. including the different job levels from junior to senior (level 1/2/3, etc.). In each job, there should be well defined and clear criteria so that employees can evaluate their levels. For a Senior Engineer for example, criteria such as technical skills, code quality, impact and teamwork need to be clearly stated. => What is the promotion process when moving from one level to another? 1- Proposition: an employee and his/her manager prepare a promotion case. 3- Committee: the decision should be made by a committee of employees with the same job functions. In this way, the committee, not the manager, decides if the promotion is to be granted or not. Employees become actors of their own career paths and are given responsibility as they also judge their peers. Managers become “cheerleaders”, who encourage their employees to reach their targets. This process relieves the tensions which arise because of promotions. 1- Optimization: make sure your job ladder is not crowded with procedures: keep the definition of the promotion criteria simple: “too many procedures kill the procedures”. 2- Accessible opportunities: beware of using vague criteria, such as “impact” for example. Impact is relative: some teams can have stronger perceived impact than real impact. For example, a company’s support team is very important, but the impact is less visible than the product team’s input as it launches new products. The members of some teams are more frequently promoted than others as the perceived impact is higher than the real one. This can make employees want to move from one team to another for the wrong reasons. 3- Reorganisation: when a startup grows from 10 to 20, and then to 100 employees, this leads to frequent reorganisation. To ensure that people don’t constantly move from one team to another during this period of high growth, stability is crucial. To learn more about job ladders, here is Arnaud's article on the topic.